It seems a desperate need for something fresh to climb has resulted in several eliminate problems being established at the Deadwood boulder at TDA. Greg Streatfield squeezed in "Dionysus" 7C (although it seems the grade will settle at 7B+), rounding the arete and topping out at the same place as "Scissor Fight". Michael Janata's creation "The Bimbler" 7C is slightly less eliminate, slightly harder, and also shares the same top out. 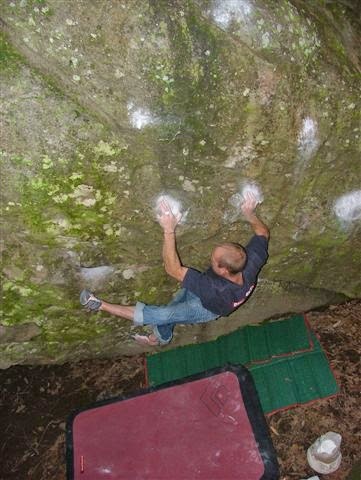 Andrew Wood then added a lower start to "the Bimbler" to create "Dead Yeti" at 7C+. Andrew also made a 4th try ascent of "Weichei" 7C+ at the Plateau boulders in Rocklands. Dale Posthumus on "Scissor Fight"